I posted this on my Facebook page, then I realized that I must have first published it here to make it an official piece, but then I thought an official piece means that I have to do a thorough review of the book. Well, I might come back and do that soon, before my classes start, but for now, it is not a bad idea to share a glimpse of the book which contains inspirational stories of young Hazara girls at Marefat High School. 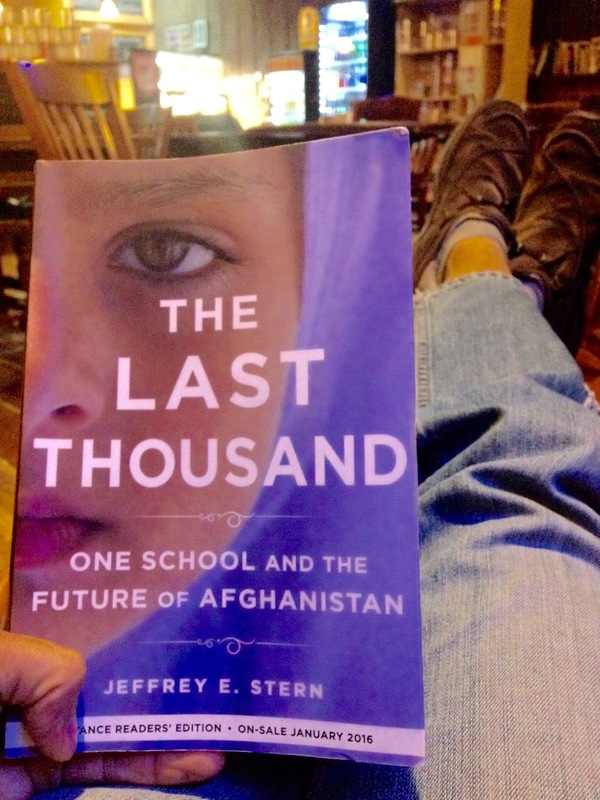 Contrary to other books that so far have published on Afghanistan and have tried to give a grim outlook of the future, The Last Thousand is the opposite, it gives an optimistic picture of Afghanistan's future, while noticing the lack of insecurity and warning about the fall of the country into the hands of the Taliban. I just finished reading The Last Thousand: One School's Promise in a Nation at War by a renowned journalist Jeffrey E. Stern. The original version of the book will come out on January 26. I started it three days ago, and thought that my incremental reading would last for a week. I was wrong. When I started reading, it was hard for me to even take a break. It is so elegantly written, so masterly told that it feels more like leafing through the diary of a dear friend that one tries to discover the secrets, than an excursion through the current historical experience of Afghanistan that centers around the young Afghan girls who are thirsty for education. The Last Thousand is all about hope, and happiness that Afghanistan needs for its futuer, like Najiba, a mother of four children who starts school at an old age because she wants her kids to be raised by smart parents; like Tamana who despite her loss and ordeal becomes a symbol of hope and strength in the school; like Yunos Bakhshi who brings his telescope to school to teach Marefat students about the universe, the other planets and our solar system; and like the Teacher Aziz Royesh, the main character who revolutionizes the minds of young girls, turning them into powerful contributors to social change and education. These girls are the powerful determinants of their lives in Afghanistan’s future. The epicenter of all these changes is Marefat, and finally it tells the reader that the crust of the Afghan society must adjust itself to the nature of ever-increasing magnitude of change that is brought by young girls. A deep and hearfelt thank you to Jeffery Stern for writing such a painstakingly beautiful book - of hope - which is full of inspirational stories!